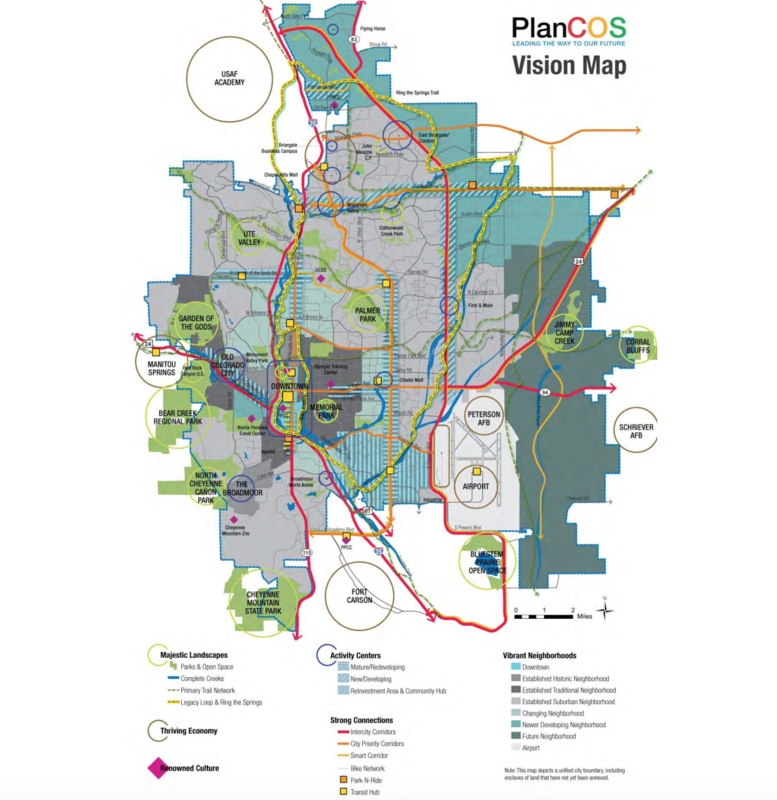 PlanCOS is the name of Colorado Springs' first comprehensive plan since 2001. Colorado Springs City Council has given preliminary approval to a new comprehensive plan, called PlanCOS. The plan replaces a previous one dating back to 2001, and lays out a vision for future development in the city, which is expected to grow by more than 200,000 people over the next 20 years. The plan prioritizes infill and redevelopment of the city's urban core and advocates for principles such as walkability, bike accessability, and the expansion of other forms of transportation that can ease reliance on cars. It also pushes for the incorporation of these principles into the development of new parts of the city, like Banning Lewis Ranch. In an effort to understand what the plan can tell us about the future of Colorado Springs, we spoke with Mayor John Suthers and Director of Planning and Community Development Peter Wysocki. 91.5 KRCC: Why did the city think it was time for a new plan? A "vision map" from the new comprehensive plan illustrates elements of the plan in map form, from proposed bicycle infrastructure to areas designated for redevelopment. Mayor John Suthers: Well, first of all, when we started this I think in 2015 or 2016, we'd gone almost 15 years without a new plan. The city is growing rapidly and it was time to do it again. I think it needs to be done every 15 to 20 years. Basically, a comprehensive plan is a guiding document that lays out the proposed physical blueprint of a city. It's not the specific planning document for a particular project, but it's kind of what we want our city to look like 20 or 30 years from now. 91.5 KRCC: The plan is quite long. What do you think are some of the top line, most significant takeaways? Peter Wysocki: The plan is organized with a vision and vision themes, what we call them, and it really focuses on reinventing neighborhoods. I see city of Colorado Springs obviously as a large city and we are made up of very different, unique, you know different-aged neighborhoods. So the plan really focuses on how do we plan for the redevelopment of our older neighborhoods and how do we plan for the development of new neighborhoods. Mayor Suthers: You know, I think a good example: we know that in the next couple of decades there's going to be tremendous growth in Banning Lewis Ranch. What do people want that to look like? We're pretty sure, based on the way things are trending. They don't want it to look like miles and miles of residential development without any commercial and recreational amenities and things like that. So as that develops and particular projects come in, the city will be looking at PlansCOS to you know say, “What should this planned unit development look like?” We don't want people driving 25 miles to get to the nearest ice cream parlor, coffeehouse, things like that. And so how do we make sure that it's a very livable environment. So as we develop Banning Lewis Ranch, we're going to be looking along those lines more so than what you might have been doing 20, 30 years ago. 91.5 KRCC: So you see this plan as an effort to kind of integrate into city policy some of the changing tastes and preferences of people -- what they want from their city, what they want from their neighborhood -- and as an opportunity to chart a new course away from the history of really suburban development in Colorado Springs? Peter Wysocki: Yes I would definitely agree with that. The last plan was adopted in 2001. That means we started working on it in the late 1990s and a lot of things have changed. You know, the economy has changed, consumer preferences have changed, how cities look at infill and redevelopment -- certainly how Colorado Springs has looked at infill redevelopment. So yes to answer your question, most definitely the plan is designed to be fluid over the next two decades. 91.5 KRCC: When you take a step back and you look at this plan and you look at sort of the vision it lays out for the city, do you think that there's a new vision, really? Do you see people thinking differently about what kind of a city Colorado Springs is and what kind of a city it ought to be from a development perspective? Mayor Suthers: I personally would answer that in the affirmative. In the past, everybody just assumed growth would be outward. I see a lot more emphasis on infill development. I see a lot less appeal in urban sprawl, if you will. And while the city has expansive boundaries, and I think over time we'll eventually fill those boundaries, I see a lot more emphasis on how are we going to redevelop Academy Boulevard. I think that's going to be a lot more emphasized than just growth for growth’s sake. 91.5 KRCC: So kind of a “growing up” rather than “growing out” mentality. Mayor Suthers: I think that's right. 91.5 KRCC: When you think about the folks who are going to come after you in this city and you think ahead to 2040, what do you hope that they will see as having been kind of the impact of this plan? The new comprehensive plan for Colorado Springs, known as PlanCOS, is out in draft form, and the city is seeking feedback. City Councilwoman Jill Gaebler is the Vice Chair of the PlanCOS steering committee and says the plan is long overdue. Colorado Springs is embarking on a two-year process to create a master plan for the city. The effort, announced Wednesday, looks to provide what's being called a "roadmap to [the] city's 20-year future," and will help guide policies and priorities. In prepared remarks at Wednesday's unveiling, Colorado Springs Mayor John Suthers said the process will look at land use planning, including growth and infill, but it's much broader than that.